Close to the Canal du Midi, this historic building was founded in 1922 in a mansion of the fifteenth century and has now been entirely renovated and offers traditional food : homemade ‘cassoulet au confit de canard’, « aiguillette » of duck with prunes & walnuts, scallops with vermouth , homemade foie gras ... Menu from 13 €. 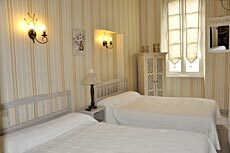 Ten rooms with bathroom en suite, air conditioning, TV, wifi. Pets allowed. Garage, terrace and secure parking.